System Hinoki is a therapeutic regimen of synergistic hair care products that interact to promote healthier hair growth by revitalizing the scalp while stimulating and stabilizing hair follicle activity. Discover the Power of Hinoki Oil, mixed with the highest quality, supplemental ingredients to maximize the benefits. 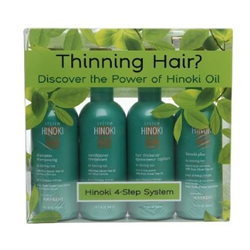 - Hinoki Shampoo - 10.1oz./300ml - Volumizing cleanser for fine and thinning hair. Contains pure Hinoki Oil. This powerful oil has been used in Asia for skin ailments for over 2,000 years. - Hinoki Conditioner - 10.1oz./300ml - A "weight-free" texturizing rinse for thinning hair that contains pure Hinoki Oil, from the mountainous regions of Japan. - Hinoki Plus - 10.1oz./300ml - Leave-in scalp conditioiner with pure Hinoki oil. 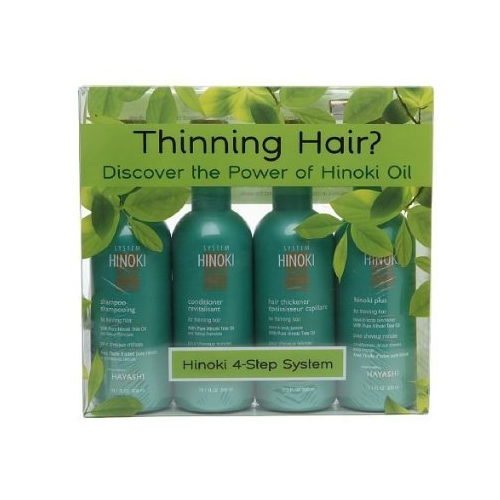 - Hinoki Thickener - 10.1oz./300ml - A highly concentrated leave-in formula of "weight-free" ingredients that infuse the hair fiber with increased diameter. Contains pure Hinoki Oil.